What is OLED? The tech, the benefits, the best OLED TVs and OLED phones | What Hi-Fi? Televisions have evolved rapidly over the past few years - we've seen smart functionality, 4K Ultra HD resolution and HDR become established features. OLED technology has also managed to work its way on to the long list of TV jargon, with its main selling points of ultra-dark black tones (surpassing even those seen on plasma TVs) and super-punchy contrast. The first OLED TVs from LG and Samsung hit the shelves in 2013, giving us a tempting glimpse of the picture quality and slimline design the technology promised. But it wasn't a smooth ride for OLED in its formative years. First Sony and Panasonic had ended an OLED TV production partnership in order to focus on Ultra HD LCD TV production and, in 2015, Samsung decided to ditch OLED and concentrate on 4K LCD screens. This left LG as the sole manufacturer of OLED screens. But fast-forward to the start of 2019 and we now have a number of TV manufacturers with OLED sets in their TV line-up: LG, Panasonic, Sony, Philips, Toshiba, Bang & Olufsen and Loewe, to name a few. They all source their panels from LG Display, although Sharp OLED displays could also be on the way in the future. At CES 2019 we even saw the unveiling of the world's first 8K OLED TV, courtesy of LG. The 88in LG Z9 OLED is due to go on sale in the second half of the year. Samsung, meanwhile, is backing a different horse when it comes to TV tech: QLED. Don't confuse QLED with OLED, though - they're two completely different TV technologies. But what's all the fuss about OLED anyway? How does OLED technology work? What's so good about it? And which are the best OLED products to buy? Let us explain. LG C8 OLED v Samsung Q9 QLED - which is best? Here’s how OLED technology works: an organic, carbon-based film is placed between two conductors and, when an electrical current is passed through, it emits light. This process takes place in every single pixel in an OLED display. This differs from an LCD (Liquid Crystal Display) panel, which requires a backlight (typically made of standard LEDs) to light up the liquid crystals and create an image. Not only does this require a lot of energy, you also can't achieve true blacks as the backlight affects neighbouring pixels. With an OLED panel, the organic pixels are self-emissive, which means they generate their own light - and so can become pitch-black when turned off. There are two types of OLED technology: Passive-Matrix (PMOLED) and Active-Matrix (AMOLED). Active-Matrix requires electronics to switch each pixel on or off individually, which is better for displaying deep blacks, and therefore the type used in the OLED TVs we see today. OLED also includes an additional white pixel alongside the usual red, green and blue sub-pixels, with the aim of delivering more varied and accurate colours (as well as increasing a display's lifespan). OLED technology has several advantages over LED-lit LCD TVs. First, there's design – OLED sets are lighter and thinner than LCDs, as they don't require a separate backlight. To give you an example of just how slim, LG showed off an OLED display just 0.97mm deep back in 2015, while you can actually buy its more recent "Wallpaper" OLED TV which measures just 2.57mm. But of greater interest is picture quality. Because each pixel can be turned off individually, OLED TVs deliver absolute black and stronger contrast ratio – the holy grail for AV purists. We've seen this striking contrast and depth time and time again on OLED TVs, most recently on the five-star LG OLED55C8PLA. Since OLED pixels emit their own light and colour, viewing angles also tend to be wider than LED-backlit LCDs: colour and contrast retain their intensity from as far as 90 degrees off-centre. And while Samsung's 2018 QLED sets are significantly brighter (the QE55Q9FN reaches 2000nits), OLED panels are catching up. You can get over 1000nits of peak brightness from a 2018 LG OLED (such as on the OLED55E8PLA). In the past, they topped out at 800nits. What are the disadvantages of OLED TV? OLED is extremely expensive to produce and, consequently, OLED TVs are expensive to buy. In its infancy, OLED production had a punishingly low yield rate - for every set fit for sale, a high number were consigned to the scrapheap. This made the technology expensive to produce - and this is one of the main reasons you still don't see OLED TVs smaller than 55in. LG’s first 55in OLED set, the 55EM970V, cost £10,000 when it launched in 2013, and the company's 55EA980W sold for £8,000. Samsung’s first OLED set, the KE55S9C, was priced at £7,000. Prices have thankfully come down in the last few years, due in no small part to an increase in LG Display's yield for 4K OLED panels. You can currently buy budget 55in OLED TVS from the likes of LG and Philips for less than £1500. Larger 65in screens are naturally more expensive and tend to clock in around the £3000 mark. Another of OLED’s problems concerns the pesky blue pixel. The organic material used to create blue light deteriorates more quickly than red and green, which means its lifespan is shorter - and, over time, the colour balance could conceivably be affected. We've never experienced any issues during our tests, mind you. Thankfully, based on our most recent OLED TV experiences, the sets are definitely getting better as they get more affordable. What about 4K HDR OLED TVs? The first few mass-production OLED models - such as LG's 2014's 55EC930V and, before that, the 15in 15EL9500 from 2010 - were Full HD screens. But with the advent of 4K Ultra HD resolution, it was only a matter of time before the two cutting-edge technologies combined. LG introduced the first 4K OLED TV - the 55EG960V - in 2015, and since then it's become an incredibly impressive pairing. HDR (High Dynamic Range) isn't exclusive to OLED TVs, but it can make a huge impact on OLED's picture performance by displaying even greater variations in colour and brightness. HDR also comes in different flavours, from the standard HDR10, HDR10+ and Dolby Vision to the broadcast variant HLG (Hybrid Log Gamma). Each has its own benefits. 4K OLED TVs with HDR include LG's Award-winning OLED55C8PLA, the Ambilight-toting Philips 55OLED803 and Panasonic's splendid TX-55FZ802. LG's 2018 range of OLED TVs is one of the few to come with Dolby Vision support as standard. What about curved, flexible and rollable OLED TVs? Thanks to the thinness of an OLED panel, manufacturers have been curving, bending and rolling them up to discover new ways of displaying and implementing display technology. Samsung was the first to curve an OLED, and there was a brief flirtation with curved TV screens a couple of years back - but it's since fallen from fashion. In our opinion, a curved screen makes more sense on a phone than on a TV. But it's LG Display who has been doing weird and wonderful things by developing flexible OLED screens, creating a 77in screen that's completely rollable, and there's the ultra-thin "Wallpaper" range, which sticks to your wall using magnets. And at CES 2019, we laid eyes on LG's 65in Signature OLED TV R. It can change its height, rolling down to just a bar of information showing weather and location, or simply disappear out of sight. Could this be the future of TV in the home? We're certainly intrigued, with the LG model is due to go on sale in the second half of 2019. There's no word on pricing, though. What are the alternatives to OLED TVs? Quantum dot technology is the biggest rival to OLED screens, most notably Samsung's most recent variant: QLED. QLED (Quantum-dot Light-Emitting Diode) uses tiny semiconductor particles only a few nanometers in size which, in theory, emit their own light. It's based on existing quantum dot technology, where the bigger particles emit red light and the smaller ones blue light, for instance. In current TVs, however, they don't emit their own light and need backlighting, just like conventional LED-lit LCD panels. However, Samsung - the main champion of this technology - has claimed its most recent QLED screens deliver all the benefits of OLED (deep blacks) but with much brighter whites (beyond 2000nits of peak brightness) and 100% reproduction of the colour volume. Hisense has also jumped on the QLED bandwagon, having failed to impress rather with its own ULED (Ultra LED) take on the tech with the £2000 65XT910. The most recent QLEDs we've tested - the QE49Q7F, QE65Q9FN, QE55Q9FN and QE55Q8DN, each a five-star performer - deliver brilliant whites and superbly detailed colours, but they still can't quite match the black depth of an OLED. The QLED sets are almost as expensive as the equivalent OLEDs too, despite quantum dot TVs being easier and cheaper to manufacture than OLED. 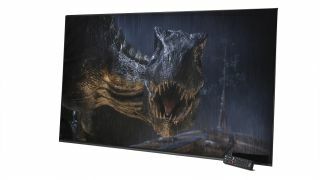 8K QLED TVs have already arrived in the shape of Samsung's Q900R range, while at CES 2019 we saw TCL launch its flagship X10 8K Quantum Dot TV. What are the best OLED TVs? Small but significant improvements on LG's best work of 2017 has resulted in this outstanding TV. By fair Panasonic's best OLED effort to date, this TV has black levels we can only describe as 'perfect'. Adding Ambilight to OLED is a delight, but what wows us is the Philips's spectacular HDR performance - it pushes LG's C8 OLED range extremely close. If you're after one of the best 4K HDR performances available from an OLED, this is definitely up there. Sony's flagship Master Series 4K OLED produces a stunning picture, thanks to its excellent black levels and class-leading motion processing. OLED displays have been used in phones for a good few years, with AMOLED the most common type of OLED screen for portable devices. While LG dominates larger OLED panel production, Samsung has something of a monopoly when it comes to smaller screen sizes. Recent flagship phones, including the LG G7 ThinQ, Samsung Galaxy S9 and Huawei P20 Pro all use AMOLED screens. Apple uses OLED screens again for its iPhone XS and XS Max flagships, while Sony has used OLED for the first time in its Xperia XZ3 smartphone. OLED screens on phones allow for the same picture performance benefits as seen on OLED TVs - brighter, more dynamic colours and deeper blacks - while also helping deliver lightweight, super-slim displays. OLED screens can also be curved or flexible, which is proving increasingly useful as smartphone designs evolve. Samsung has announced plans for a foldable phone in 2019, while patents for a double-sided smartphone have also resurfaced. Let's hope it comes with super-strong glass, too. If some reports are to be believed, Apple is also looking to launch a foldable phone in the next couple of years.